Cheap airport lounges at Stansted Airport - Compare and Save. You certainly don't need to spend like a VIP to get VIP service and treatment. 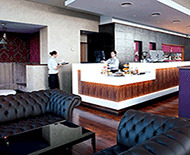 You can get superior treatment at a Stansted Airport lounge by making your booking now. London Stansted has seen a steady expansion since the turn of the millennium to accomodate more passengers. This is now the UK's third busiest airport so an airport lounge goes a great way to providing some refuge from the hustle and bustle of a busy terminal. See the list of lounges we have available below. No. 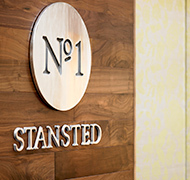 1 Lounge Gate 16: Enjoy panoramic views of Stansted's runways while enjoying the comfort of this sophisticated lounge. Bonus features include breakfast meals and a day time menu for those passengers requiring a meal. No. 1 Lounge Gate 49: Quench your thirst at the fully tended bar or order a hot meal. Open from 4am you'll be able to rest up away from the crowds at this peaceful lounge before your flight. 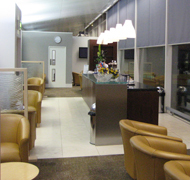 Servisair Executive Lounge: This cosy lounge offers seating for 35 people in the comfort of a relaxed and quiet lounge. Servisair have layed on soft drinks, alcoholic beverages and snacks as well as newspapers and popular magazines.